This Sicily villa is named after our step daughter and we have realized a typical Thay garden in memory of her homeland. We are just a a stone's throw from the beach! This is the cozy location of this property, situated in an exclusive residential area. Passing the main gate there is a tropical garden (that the owner has devoted to his Thai daughter), greenery and well maintained, full of Sicilian and Asiatic plants as: lemon trees, palm trees, ficus, yucca … and a lot of aromatic ones as well as many seasonal flowers. At the end of the garden, facing the main entrance of the villa, stands the pool area, equipped with chairs, tables and sofa. The outdoor is full of lovable spots as well as: gazebo, benches under the trees, porch … It’s a very relaxing landscape ! The villa spreads on one level, overlooking the garden and the pool. All the rooms are bright, facing the exterior. There are two double bedrooms, a huge living room (with double sofa bed), and a bathroom. And there is also a sort of winter garden, the very highlight of the house. Spacious and elegant this room has a lounge with the television and a stunning kitchen fully equipped with an elegant wooden table, ideal for your Sicilian summer meals. From this room you may access both, to the shining and relaxing pool area (from the eastern door) and to the barbecue area (from the western door). This last one shows a stone oven, so typical in Sicily. Don’t worry: we’ll let you know how to prepare an unforgettable and delicious pizza ! Our villa is in a stunning position, just 100 meters away from the renowned sand beach of Bruca, in Scicli area. Here you can find also a Lido (private beach), by the sea, where you can enjoy the restaurant or the Cafè or also, if you like, rent deck chairs or umbrella. The villa is located in a residential area, characterized by other exclusive properties. If you want to rent a villa in Sicily, and if you are in search of sea and calm, this villa may suite your will. Bedrooms (2) and Bathrooms (2):a double bedroom on the ground floor; a double bedroom on the ground floor; a sofa-bed (double) on the ground floor(living room); a sofa bed (single) on the ground floor(living room); a bathroom with shower on the ground floor; a bathroom with a hydromassage shower on the ground floor;an outdoor shower near the pool. MAMMA'S ANGELS TIP (by Sandra, who will welcome you at this villa): Walking along the promenade of Cava d'Aliga (1 km) taste a lemon granita. 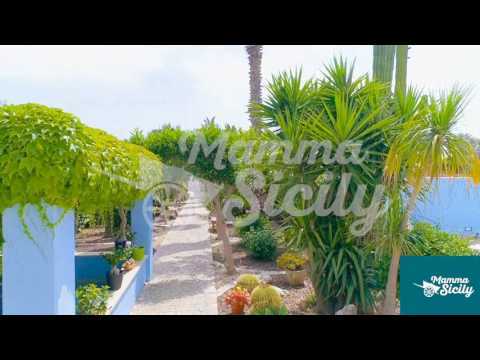 This Sicily villa is named after our step daughter and we have realized a typical Thay garden in memory of her homeland. The BBQ area: fish of course, you are in Sicily! We are just a a stone's throw from the beach! This is the cozy location of this property, situated in an exclusive residential area. The villa spreads on one level, overlooking the garden and the pool. All the rooms are bright, facing the exterior. At the end of the garden, facing the main entrance of the villa, stands the pool area, equipped with chairs, tables and sofa. The outdoor is full of lovable spots as well as: gazebo, benches under the trees, porch … It’s a very relaxing landscape ! Our villa is in a stunning position, just 100 meters away from the renowned sand beach of Bruca, in Scicli area. Here you can find also a Lido, by the sea, where you can enjoy the restaurant or the Cafè or also, if you like, rent deck chairs or umbrella. I live in the most beautiful town in the word (Scicli, photo, 4 km's away), a bit because it is said by the great novelist Elio Vittorini and a bit because it’s my homeland that I love for its naturalistic and artistic beauties and, most of all, for its landscapes, its light, its blue sea, its golden beaches! Scili, together with Modica (8 km’s away) and Ragusa (10 km’s) it’s a Unesco’s world site for Baroque style. Scicli is a very picturesque town, with its typical white stone that make it a real Sicilian village. In fact my town is also the spot for the well-known movie fiction Inspector Montalbano. The via Mornino Penna is the hearth of the city and here you can find many nice buildings, restaurants, pizzerie, cafe and a beautiful Museo del costume. Don’t forget to visit at least one of the three hills that overlook Scicli. You can go up to them walking through narrow alleys, among low houses and fianlly ... the top, where one can enjoy an unforgettable sunset. Our golden beaches are among the most famous in Sicily: Sampieri (5 km’s), Cava d’Aliga (1 km’s), Donnalucata (8 km’s) and Marina di Ragusa (15 km’s). If you nature lover these are my suggestions: Irminio river (10 km’s), the lakes of Cava Grande canyon (photo, 50 km’s) and the astonishing Vendicari a paradise for birdwatchers. This is the menù I suggest you (with the kind permission of Mamma’s chef Silvana, of course): sea fruits, squid, sepia, mullet, pasta with swordfish, teste di turco (photo, a typical Scicli’s sweet). In Donnalucata (8 km’s) you will find a renowned outdoor fish market for a very Sicilian BBQ!